Spectral Conquest is an effect plug-in that lets you directly manipulate the frequency spectrum of audio signals. The incoming signal is analysed via a FFT (Fast Fourier Transform), resulting in the familiar spectrum plot where the full audio spectrum is split into a number of narrow frequency bands. The outgoing audio is then regenerated by an Inverse FFT. The interesting bit is that the plug-in lets you modify the frequency spectrum in between. 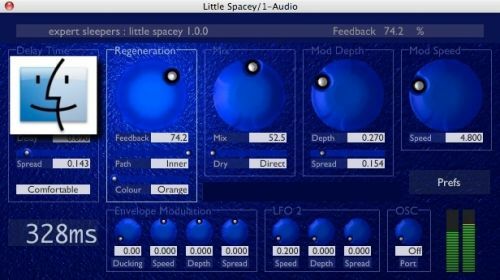 Little Spacey is delay effect, inspired by classic analogue ‘bucket brigade’ delays but with refinements only possible in the digital arena – not to mention a maximum delay time that would cost a small fortune to realise in hardware. Great care has been taken to give Little Spacey the smooth, creamy sound which makes analogue delays still popular today. Crossfade Loop Synth is at heart a simple sample playback synth plug-in. It plays samples in the classic sampler manner – by simply altering the playback speed according to the desired note. No fancy timestretching or pitchshifting is applied. You can control how the sample is looped as it is played. An adjustable amount of crossfade can be applied to the loop endpoints to smooth the transitions. This makes it extremely easy to produce glitch-free pad sounds. The loops can also be played backwards and alternately forwards and backwards (pendulum-style).